As I read to you from Paradise Lost. So many dreams so dearly bought. I tasted paint through bitter tears. And the paint and the pain. The paint and the pain. 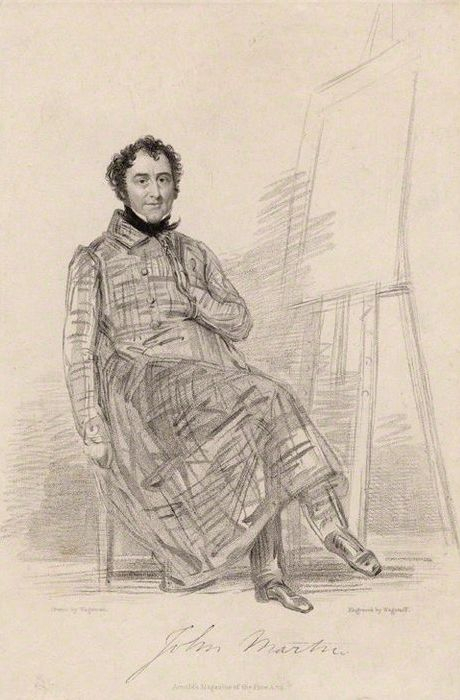 John Martin in his Studio [pencil sketch] Charles Edward Wagstaff, 1834. In: Arnold's Magazine of the Fine Arts. In 1809, at the age of nineteen, John had married Susan Garrett of Crondall, Hampshire, at Marylebone Church. They met through their mutual association with the Mussos. Susan was several years his senior. Two of their eight children died in infancy and they also endured the terrible suicide in their home, of their young nephew Richard, whom they had adopted and raised as one of their own when his father Jonathan was confined. Susan was undoubtedly her husband’s rock, muse and inspiration, as well as the “life and soul” of his lavish parties, being totally devoted to her husband at every turn.